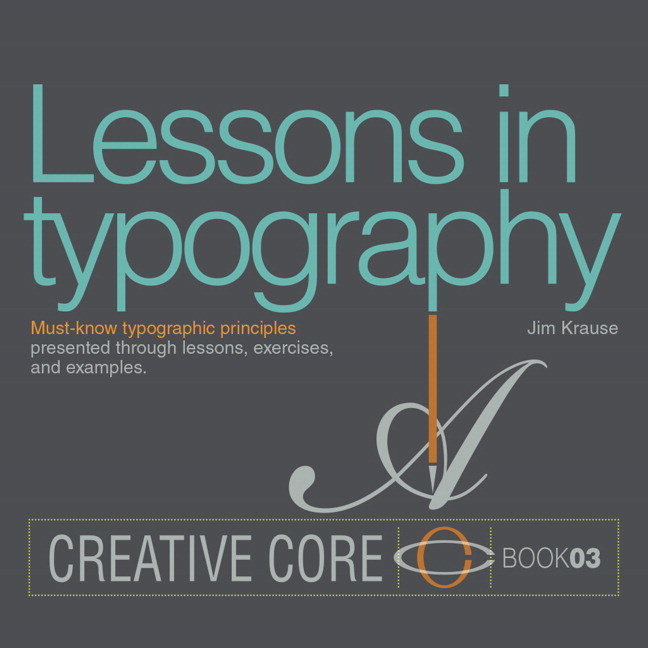 Design students get hands-on with type in this lesson-based addition to Jim Krause’s popular, new Creative Core series on design fundamentals. Lessons in Typography uses big visuals, concise and witty explanations, illustrated captions, and lots of lessons and exercises to help students become invested in–and even geekish about–designing with type. Students can work through the exercises on their own–or within a class setting–to learn how to do things like make their own fonts, customize characters from existing typefaces, craft logos from letters, design personal emblems, and fine-tune the look of the headlines and text used in layouts. Krause covers all of the basics of understanding, identifying, and designing with type using attractive, contemporary, and compelling examples of logos, monograms, headlines, word graphics, and text blocks–each of which has been custom-created by Krause solely for the purposes of this book (an approach rarely seen in books dealing with type). Lessons in Typography–releasing on the heels of its companion volumes, Visual Design and Color for Designers–is the third book in the New Riders Creative Core series, which aims to provide instruction on the fundamental concepts and techniques that all designers must master to become skilled professionals. Jim Krause has worked as a designer and illustrator since 1982. His clients have included Microsoft, Boeing, Seattle Schools, Washington Apples, and dozens of others. His first book, Idea Index , was published in 1999 and immediately became the best-selling art/design-related title at HOW Books. Krause is the creator and author of the New Riders Creative Core series, which includes Visual Design: Ninety-five things you need to know. Told in Helvetica and Dingbats and Color for Designers: Ninety-five things you need to know when choosing and using colors for layouts and illustrations . Krause lives and works in Bellingham, Washington.